We have been tracking the Apple Tablet for longer than I want to remember. Here's an update on the probability of it happening at all, and when we think it will launch if it does. As far as I'm concerned, I've wanted a son of Newton since Jobs cancelled it, and I've been gagging for it since the iPhone. The latest solid rumor came from the Financial Times, which claimed that the entertainment industry "is hoping that Apple, which revolutionized the markets for music players and phones, can do it again with the new device." Suggesting it will be more giant iPod touch (good—as the iPod touch could scale up into new form factors) than pure Mac OS X Tablet (bad—as pure Mac OS X will be hard to scale down). A project with the music industry—codenamed Cocktail—will be announced in September, according to this source. The same sources point that "the device could be launched alongside the new content deals." The new content will also include books, which will put the device in direct competition against Amazon's Kindle. The Financial Times article is vague about this, however, mentioning Apple "racing" to have the tablet available for the holiday shopping season. That may mean an announcement in September, followed by availability after Thanksgiving. That's four months away. Another article—this time from the China Times—points at an October release, which puts the thingamajig only three months away. And yet another Chinese paper claims a September or October release. Apple Insider claims that it will be available in 2010. I'm personally inclined to trust the Financial Times rumor. Not only because of them being so adamant about their multiple sources, but because the timing makes a lot more sense than the other options. It also makes sense to announce it in this entertainment event, which will most probably include announcements for the updated nano and touch—minor updates for already-established products that only add cameras, confirmed by a myriad of new cases from China. The big bang, however, could be the newest member of the iPod/iPhone family: The Apple Tablet. Like the iPhone—which was originally announced alongside other products during a MacWorld keynote—the Tablet won't cannibalize any existing product sales, so it makes sense to drum up the hype like they did with the iPhone, building excitement for the shopping season. Matt, on the other hand, thinks that the device could be announced on an event on its own. His rationale is that it's too important to be released alongside other products. To me it makes more sense to tell the public that, while big—literally and metaphorically speaking—this is "another iPod", and the third model of a new family of iPhone OS-based products—a potential family which, incidentally, has been hinted by Jobs and the rest of the Apple executive team. Click to viewWhenever it is actually announced, however, the general consensus is that the tablet exists—even John Gruber is certain about it, and he rarely fails. The question now is when. 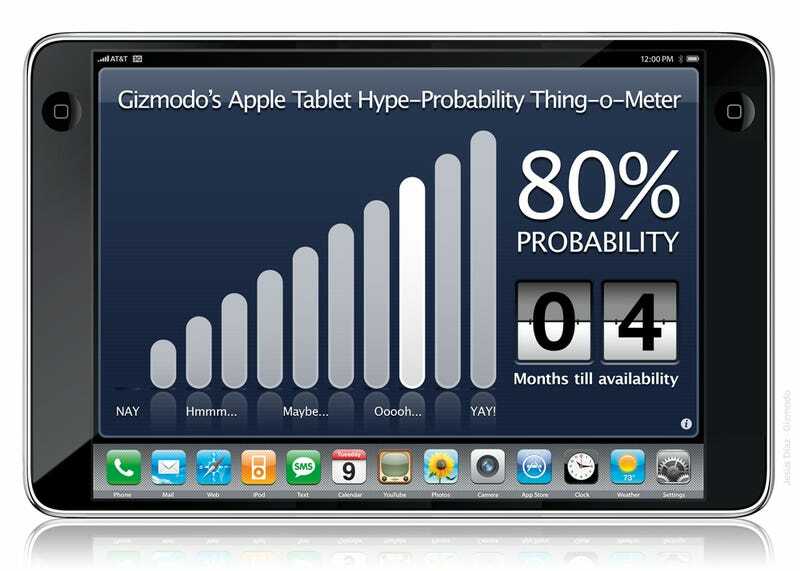 According to our Apple Tablet Probability Meter, you're 80% likely to be able to buy one in four months.